Ashraf murder case : Prime accused Bharath in police custody ? 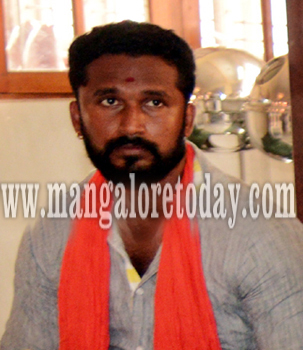 Mangaluru, July 1,2017 : It has been reliably gathered that Bharath Kumar Kumdelu, said to be the prime accused in the SDPI leader Mohammad Ashraf Kalayi murder case, has been taken into custody by the police. However, there is no official confirmation as to yet. It may be recalled here that Ashraf was hacked to death at Benjanapadavu on June 21. Earlier, police had arrested six persons in connection with the murder. Ashraf was murdered by some masked men who had come by bikes and had waylaid his autorickshaw. Sources say the prime accused Bharath was seen with RSS leader Kalladka Prabhaker at a press meet some time back.